A treasure hunt in Pale Pass leads to a magical ring hidden many years ago by an unlucky thief (non-journal). Note: This quest does not appear in your journal. You must start Lifting the Vale quest before Pale Pass even shows up on your map. 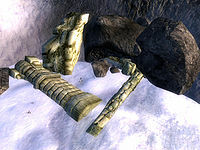 Find four containers in order near the fort in Pale Pass. A key found in each one allows you to open the next. In the last container is the Circlet of Omnipotence which grants +3 Fortify each to Agility, Endurance, Speed, Strength, and Willpower. While on the quest Lifting the Vale, you will go through the Serpent's Trail to Pale Pass and follow the path to the ruined fort. Once you reach the ruined fort, you're ready to find the treasure. There are four containers to be found. The first three have a key to the next container, and the last one has the Circlet of Omnipotence. Frozen Barrel – east of the ruined fort in a circle of ice (ESE of the entrance to Mouth of the Serpent). It contains a Rusty Key and a Crumpled Note from some unlucky thief informing you that he hid a magical ring in a chest. Rusty Chest – inside the most western tower, next to the tower with the entrance to Fort Pale Pass. Search carefully to find this chest, as it is hidden by grass and partly buried into ground. Look along the inner walls of the tower to find it. This chest contains the Old Key. Old Chest – located southeast of the entrance to Mouth of the Serpent. Follow the path south, back towards the Serpent's Trail, past the statues on either side and you will reach a fallen column. Travel in the direction pointed by the column and jump onto the rock at the base of the curved wall you find. The chest is just to the south and contains the Forgotten Key. Forgotten Chest – southwest of the door from the Serpent's Trail through which you first entered Pale Pass. From the door go southwest up the hill (to the right if you are facing the door), sticking to the natural rock wall that forms the outer edge of the valley. Keep following it as it curves east, then south, then back west, and you will come to a large rock with a tree beside it. On the far side of the rock, you'll find the chest. In it, you will find the Circlet of Omnipotence. The console command tg, which toggles the grass display on and off, can make the chests a bit easier to spot. 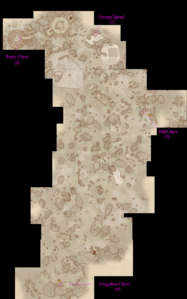 All of the chests in Pale Pass respawn, so you can return to the Forgotten Chest in a week and take another Circlet. You cannot wear two Circlets of Omnipotence at once, but you can sell one or put it in your storage.